David Moyes has already begun the process of looking for new recruits, with right-back, striker and centre-half the three positions that are his immediate priority. 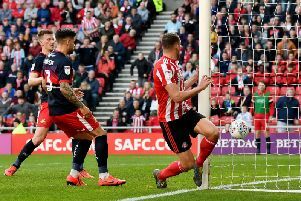 New Sunderland manager Moyes has enjoyed an eventful first 48 hours at the helm after he received a rousing reception from 3,000 travelling fans in Saturday’s 2-1 pre-season win at Rotherham. Moyes will take charge for the first time in tonight’s friendly against Swiss outfit Stade Nyonnais (6.30pm kick-off) after the Black Cats were forced into an emergency landing en route to France yesterday when their plane suffered engine failing. The ex-Manchester United boss will get a chance to familiarise himself with his new players during a week-long stay in France, but bringing in fresh faces is just as pressing for the Scot. Sunderland are yet to bring in any fresh faces this summer, with incoming transfer business put on hold during the FA’s protracted pursuit of new England manager Sam Allardyce. But Moyes is wasting no time in his recruitment drive, with strengthening Sunderland’s options up front and at the back understood to be already on his hit-list. Right-back and striker are clearly areas where Sunderland lack options, but there are only three senior centre-halves on the club’s books after the departure of veteran Wes Brown at the end of last season. Allardyce had lined up several players in case he remained at the Stadium of Light, including West Ham striker Diafra Sakho and Paris Saint-Germain right-back Youssouf Sabaly. But the pair – both represented by agent Mark McKay, who helped Lamine Kone join Sunderland in January – may not be such prominent targets for Moyes. Sunderland have also been linked with Manchester United striker Will Keane and Aston Villa defender Micah Richards, while trialist Charles N’Zogbia scored the winner during an impressive display at Rotherham and travelled to the Lake Geneva area yesterday. Moyes certainly believes he will have the backing to make the four or five new signings that Sunderland require, despite Allardyce understood to have been operating with a limited budget. “They have given me some guarantees and reassurances about what we can do, because let’s be fair, we’ve got a big club which we need to take forward, and make sure we aren’t celebrating staying up. That can’t be the goal,” said Moyes in a club website interview over the weekend. Moyes – who is not expected to do any press interviews during Sunderland’s time in France – will also have to decide on the make-up of his backroom team. Assistant manager Paul Bracewell and first-team coach Robbie Stockdale took charge at Rotherham, with the latter particularly highly-rated by both the club and the players. But former England international Gary Neville is understood to be one of the names under consideration to join Moyes, who took Phil Neville, Steve Round and Jimmy Lumsden with him to Manchester United after ending his 12-year stint at Everton. Gary Neville – currently on holiday in Majorca – resigned as an assistant to departed England boss Roy Hodgson last month after an ill-fated spell in charge of Valencia last season. However, Moyes’s arrival will not affect Sunderland’s bid to offload the club’s dead-wood, with negotiations continuing with Championship club Leeds United over the sale of midfielder Liam Bridcutt. Sunderland are keen to bank a fee in excess of £1million for Bridcutt, who impressed Leeds during his six-month loan stint at Elland Road last season.